Last week we offered up some of the highlights from the “Volunteering and Civic Life in America” research report. 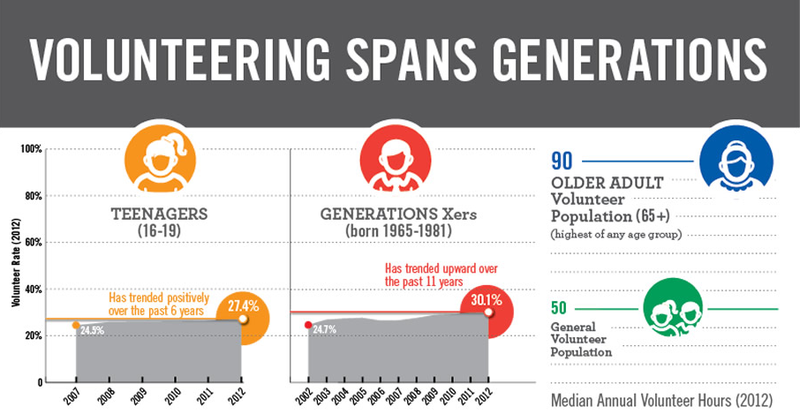 As their infographic illustrates, “volunteering spans the generations” - including teenagers and Gen Xers, along with parents and older adults. Sometimes, all it takes is a small tweak of your charity's current policy to include under-16s, and if not then perhaps they will be covered by their school or youth group's policy or award scheme…. For the full list of suggestions, you can read the full article here: Why Charities Need to Embrace Younger Volunteers. What about your organization? Are you recruiting teens or younger volunteers? Some of the non-profits I work with discount the potential value young volunteers offer. However, I find that they bring new energy and ideas into organizations. Their enthusiasm is refreshing, but can be challenging for long-term "veteran" volunteers and even staff to embrace. It's "work" to manage them, but I don't think it's any more challenging than managing a new volunteer of any age. Barbara: Yes I agree that the energy and enthusiasm that younger volunteers bring usually makes any additional management time worthwhile. My engineering professional society added college student representatives to the Board of Trustees several years ago and it has been a great experience for us. They have been very responsible and helped the older trustees connect with the future of our organization while we developed the next generation of leaders. On a local level, we did a hands-on science demo at a huge science festival for families last fall. Our demo squad included two teams of adult engineers with their teenage kids. The teenagers caught on quickly and loved teaching other kids what they had learned. The kids attending the science festival paid more attention to their peers than to the grown ups. Peg: Thanks for sharing your experiences with both college students and teenagers. Good to see the generations helping one another! This is great. Thanks for sharing! I'm with Youth Volunteer Corps, an organization devoted to increasing quality youth service opportunities throughout the U.S. and Canada. We believe that youth can change the world, and we love encountering other nonprofits willing to give youth this chance. One of our biggest challenges is actually convincing agencies not to underestimate all that a group of youth can do. More often than not, we accomplish everything on their list in half the time they've allocated! We hope that more nonprofits will tap into the power of youth volunteerism! Lacey: Glad you enjoyed the post and thanks for offering your experience with "giving youth a chance."